As a wedding photographer, I’ve seen simple mistakes with hair that have made a huge difference and I would love for you to read this little article so you don’t make those same simple mistakes. These little mistakes can make a huge difference to the quality of your wedding photography here in Cancun and the Mayan Riviera, Mexico. You might have the gorgeous flowing mane of hair that you have spent months getting into perfect condition for your wedding, it might be dead straight and incredibly thick and never move out of place, but my guess is you don’t live on a beach with an evening breeze and near 90% humidity. Cancun and the Mayan Riviera is hot, windy and humid year-round on the beach. And I mean humid – 90% humidity at times. Your hair will land at the airport in Cancun and develop an interesting and lively life of its own. The Mayan Riviera is so humid I am pretty sure even mink would look like they have an 80’s style perm! And let’s be honest, the last thing you want is for you to have a bad hair day on your wedding as these are images we want you to cherish for all the right reasons. The beach is windy – really windy – unless you and your guests have hair that is an inch long you will need to have some way of clipping it back and getting it under control. Otherwise you may have lots of photos with hair whipping across faces, or worse, group shots where people have hands across their faces as they try to toss their hair back. A few loose bits are fine, but please encourage your bridesmaids to wear their hair up or back or in the very least, under control so that they are more comfortable in the heat and the photos look better. Now for the technical side of it. Long hair worn down means you can only be shot one way (from one direction) on the beach. Most of the time the wind goes from East to West (from offshore to inland) and often from a north Easterly direction. This means you can only be shot walking into the wind – towards the East/ North-East. Otherwise you will have hair all over your face. What this means is that we don’t get to choose the background based off the beauty of the background, but rather we choose the background off which way you can stand in the wind and not have your hair in your face. It also means that if the best light is coming from another direction, we will not be able to photograph you in the best light. The conclusion of this is that leaving your hair down really handcuffs me as a photographer and does not allow me to get the best images. Or think of it this way. You have long flowing hair. Your getting married on the beach and want the turquise blue ocean in the background. The wind is, as usual, blowing nicely in from the ocean onto land as usual. Your back is facing the ocean and the wind is blowing the hair from your back to in front of your face. And we can’t get the amazing images you have been dreaming of, sadness. So please think up-do, think back, or just think and be aware. If you or your bridesmaids are going to do your own hair please bring about 3 times the amount of hairspray you think you will need and don’t be afraid to use it. The humidity means each and every strand literally has to be coated in it for it to work. Oh, and don’t forget to bring LOTS of bobby pins, and ask your bridesmaids to carry some on the day. They are great for pinning down any strands that get loose when you are down on the beach. If you are planning to wear a veil please please please remember to pin it in place. 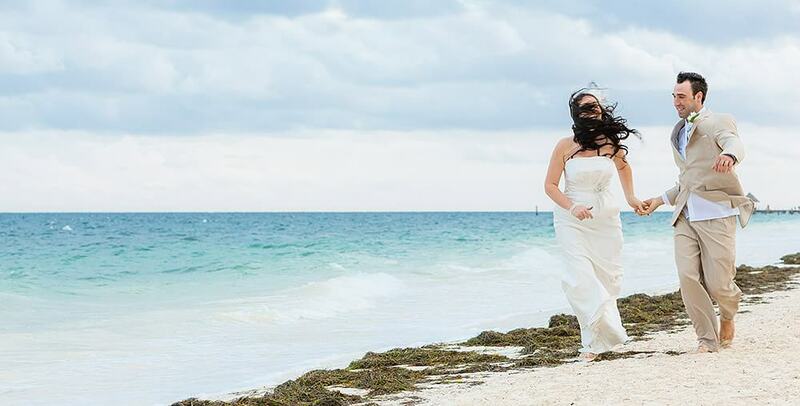 I have seen a veil get ripped off by the wind while a bride walked down the isle with her father and end up 30 ft in a palm tree. Funny, kind of, but not exactly the memory you are hoping for. And don’t get me wrong, I love veils and a long veil do look stunning in the wind but it looks best when it stays on the bride! And then there is Photoshop. Photoshopping hair in wedding photos can be a nightmare. It is really difficult time-consuming work where you need a very good artist doing the work. So please don’t think, you can simply get your images photoshopped after your wedding. Finally, if you want a referral to a great hair stylist please use our Contact Page and either I or Samantha will be happy to help you find someone that is perfect for you.